Unite with us to bring Owensboro together! The H.L. 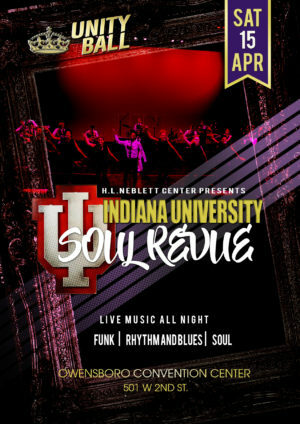 Neblett Community Center invites you to join us for our Unity Ball featuring Indiana University Soul Revue on Saturday, April, 15 at 6pm. The purpose of this event is to bring a collaborative group of community organizations/non-profits together to unite all people. Portions of the proceeds of this event will support participating non-profits and offset the cost of our annual “Youth Unity Festival” to be held in August of 2017.